I’ll be honest, this is my FAVORITE pasta salad. I think of this salad as the perfect summer pasta salad, but to be honest, we make it year round because we like it so much. I posted the recipe for the chipotle paste that is used in this salad in a post yesterday. This is the punch that gives this pasta salad a great flavor. You can use any type of pasta that you like this. We used to get a big bag of multi-colored garden rotini from Sam’s Club but we haven’t seen it at our location lately. This was a great noodle for this salad because it holds up great and the color makes it fun. The Sam’s website shows it should be in stock at our location so we’ll have to look for it again. In the pictures, we’re using a fusilli pasta from Trader Joe’s. We’ve also used farfalla pasta in the past but it broke apart so I’d stick with a thicker pasta with more grooves on it. To start, cook your pasta noodles according to the directions on the package. Definitely pay attention to the time and don’t over cook this pasta or it will fall apart while you’re mixing it. Read the next step before you finish. You’re going to put the hot pasta water into a bowl with the red onions and carrots to soften them. While the pasta is cooking, get your vegetables ready. Once they’re cut, put the red onions and carrots into a small glass bowl. When the pasta is finished cooking, pour the hot water into the bowl with your red onion and carrots. Let this soak for about 10 minutes. Then, drain the carrots and onions and rinse well. Now, mix the mayonnaise with the chipotle paste until it’s well mixed. It should turn a pinkish color. Add the pasta noodles, tomatoes, carrots, red onion, cilantro, jalapeño, and the mayonnaise chipotle paste mixture into a large bowl and gently fold the ingredients together. If you look close, you’ll see that the picture actually uses parsley instead of cilantro. It gives the salad a different flavor but it’s just as good. If you have family members who don’t like cilantro, just substitute the cilantro for parsley and it will turn out great. Once the noodles are well coated with the mayonnaise chipotle mixture, you are good to go. You can eat it right away or “sample” it just to make sure 😉 – however it’s best if you put it in the refrigerator and let it cool for at least an hour. Chipotle Pasta Salad after it’s been mixed. Obviously, this makes a bunch of pasta salad and way more than 2 people can eat in one meal. It’s a perfect side to take with you to a BBQ or summer cookout. It also likely means leftovers! This salad will last a week or so in the refrigerator. When we serve it, we’ll sometimes put it over a bed of lettuce which adds a nice texture to it. For lunch, I’ll sometimes take a small bowl of this pasta salad and mix in some tuna for a tuna salad – this is so great and easy for a lunch at work. It’s been a while since I added a post to our blog. To be honest, I’ve started a few posts but ran out of time or didn’t have good pictures to include. I’ll get them posted next time we try the dishes. This post came from an inspiration reading about seasonal eating in Abruzzo, Italy. I had just read the post and went out to uncover our grill. 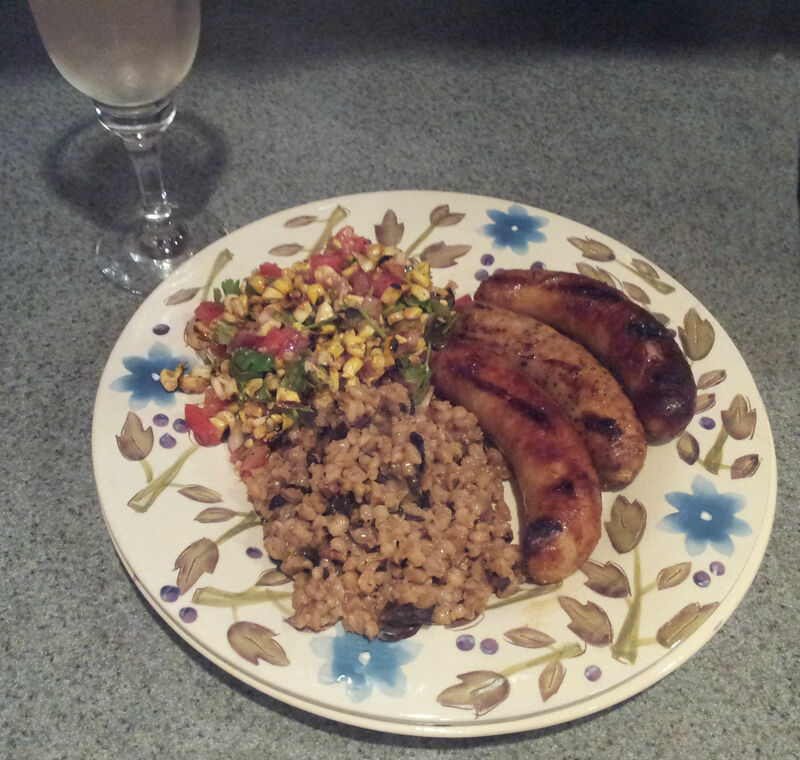 I was planning on grilling sausage and corn-on-the-cob. 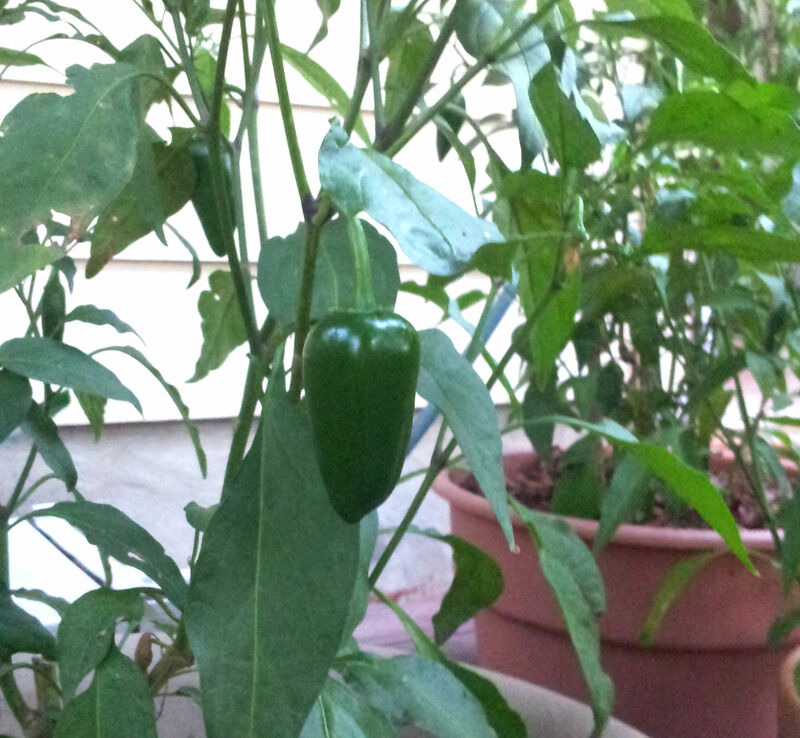 The post I just read made me think we needed to do something more than plain corn on the cob and then I looked down and saw big, ripe, jalapeno peppers on our plants. The pepper is what got me thinking about seasonal foods here and how to mix them together. Seasonal cooking here in Texas is a little complicated. Our supermarket’s produce section barely changes throughout the year. We have a very constant selection of just about any produce you could want year round. I think this is partially due to our temperate climate and close proximity to Mexico, which sends us a constant supply of fruits and veggies. Our farmer’s market is the place to go to find fresh seasonal, locally grown produce. The only downside to this is that you pay a hefty premium to get the local produce. Don’t get me wrong, I really want to support the local farmers but I just can’t justify paying twice the price you can find at the local store. Anyhow, back to my seasonal post, this one contains the flavors of summer in Texas. Fresh corn, jalapenos, tomatoes and cilantro. Living in a condo, we can’t grow our own corn but we do grow tomatoes and peppers. It’s still a little early for tomatoes so the peppers are the only items fresh from our container garden. To start, make a rub for your corn by mixing the olive oil, chili powder, smoked paprika and coarse kosher salt together in a small bowl. This combination can be adjusted to fit your taste. Pull the husks off your corn and then coat each one with the rub mixture. Then put the corn on a hot grill. You’re going to cook the corn for 4 to 5 minutes, then turn 1/4 turn. Repeat this 3 times until you’ve completely rotated the corn. This will take 16 to 20 minutes. The kernels will blacken in some places, but that’s OK! It adds lots of flavors to the dish. 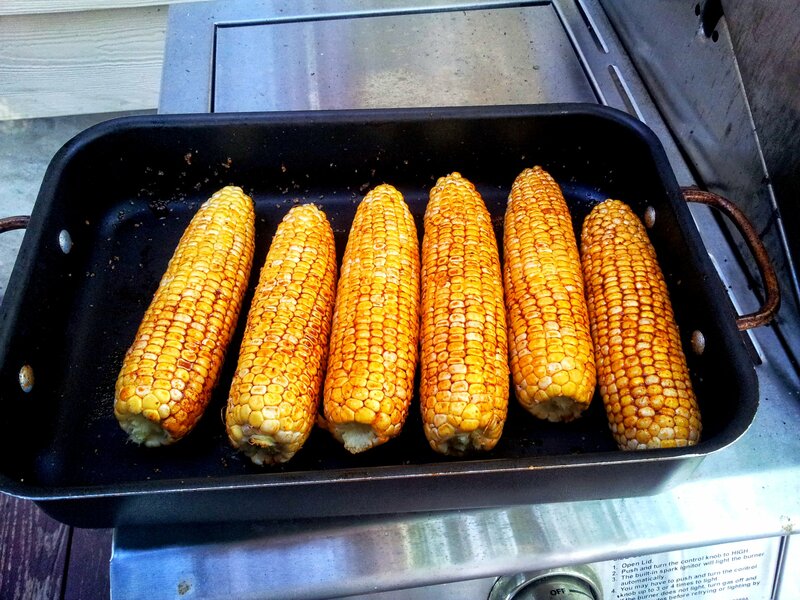 Every grill is different so you might have to adjust the heat or placement of the corn. Just watch out for flare-ups because you don’t want to get too much char on the corn. Also, this is a great way to cook corn on the cob, so if you don’t want to make the salad, you can stop here and just enjoy the great corn. 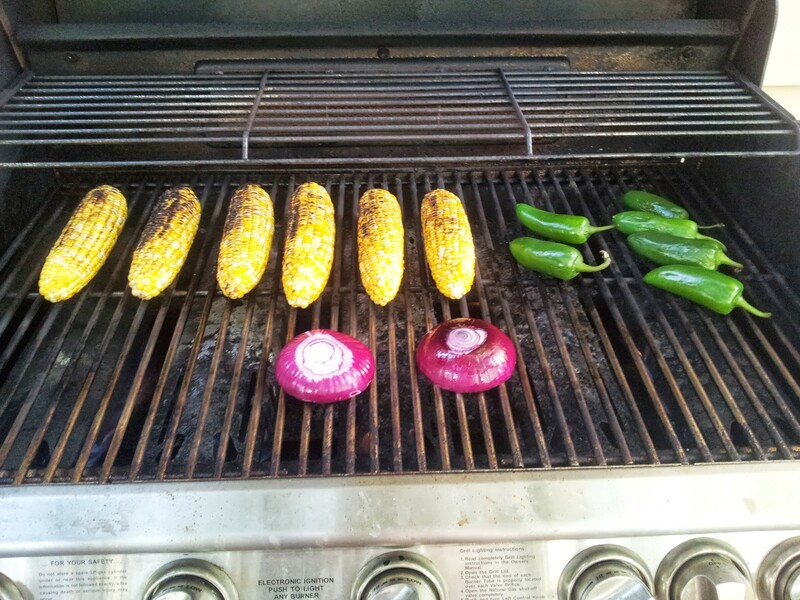 After you make your first turn of the corn, add the whole jalapenos and the 2 halves of your onion. 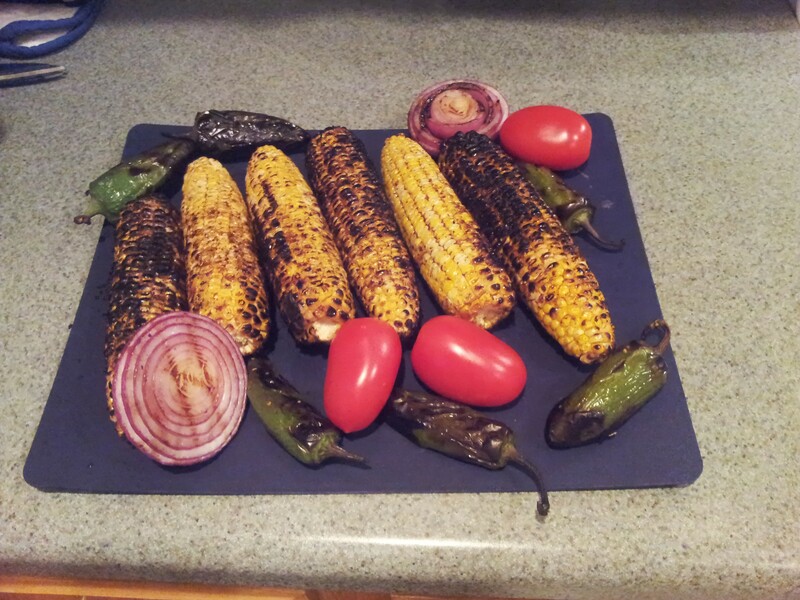 The goal for the jalapenos is to blacken the skins but not to completely cook the pepper. Turn them every 3 or 4 minutes until the skin starts turning black. There should still be some firmness to the pepper. For the onion, just cook it for about 5 minutes per side. Like the jalapenos, we’re just trying to give it a little char and grill marks but we still want it to be firm and have texture. Once each item is done, pull it off the grill. Let them all cool down and rest for a few minutes. It needs to be cool enough to handle so give it at least about 15 minutes to rest and cool. Take a knife and cut off the kernels from the corn and put them in a large bowl. Then coarsely chop the peppers, onion and tomatoes into cubes about the size of the corn kernels and add them to the bowl. Now, chop your cilantro and add this to the salad. You’ll want to add a little dressing to this salad, but just enough to coat without it getting soggy. For this, mix a tablespoon of olive oil and a teaspoon of lime juice and then drizzle it over the salad and mix it all together. You’re also going to want to add salt and pepper to taste. We usually wait to add salt and pepper at the table but you can add it at this point, too. This recipe can be altered many different ways. You can substitute sweet bell peppers for some of the jalapenos to cut down the heat and you could substitute basil or parsley for the cilantro. This is an easy recipe that is sure to please your family and friends. 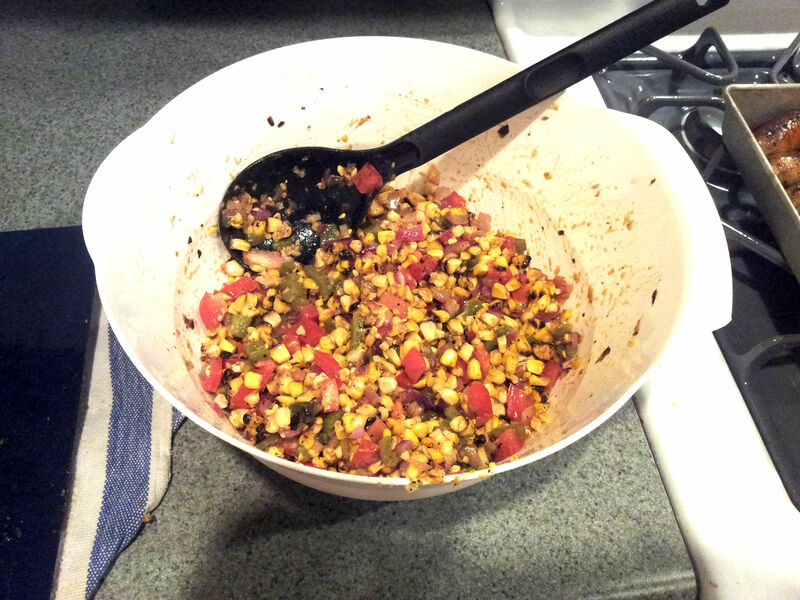 You’ll also notice that we grilled more corn and peppers than this recipe calls for. I think if you’re going to heat up the grill, get the most out of it. The corn and peppers will store well in the refrigerator until later in the week.